Three teenage girls in Washington, D.C., came up with a way to purify lead-contaminated water in school drinking fountains that was so impressive it landed them among the finalists in a NASA-sponsored contest for high school students. Mikayla Sharrieff, India Skinner and Bria Snell earned a spot in the contest finals ― the only all-female, all-black team to make it that far, according to The Washington Post. To win the public voting part of the competition, the trio of 17-year-old juniors took to social media to raise awareness of their project. Their hard work looked like it was paying off. On Sunday, the girls were in first place with 78 percent of the vote, according to Blavity.com. But that’s when a group of users from 4chan —an anonymous Internet forum whose members have been known to spew racist and homophobic comments ― targeted the girls, according to the Washington Post. 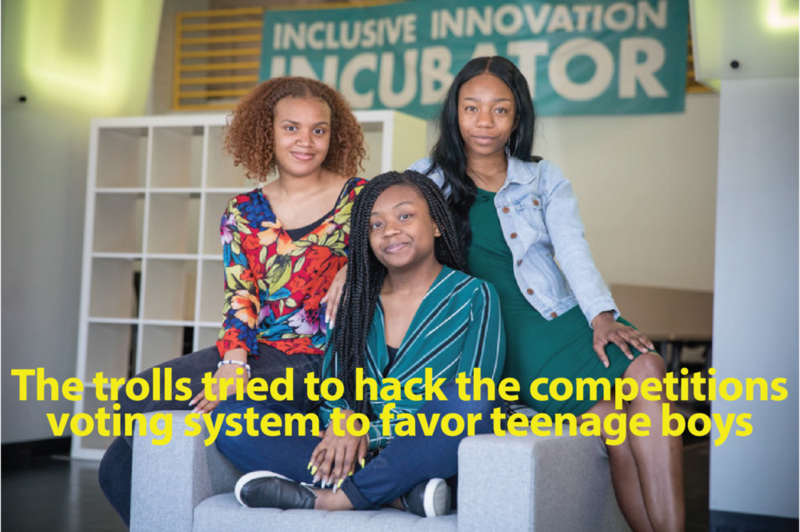 The users alleged the teens’ project didn’t deserve to make the finals and that the voting was skewed because the black community was only voting for the girls because they were black, according to the paper. The trolls also suggested methods of hacking the voting system to favor teenage boys. “Unfortunately, it was brought to NASA’s attention yesterday that some members of the public used social media, not to encourage students and support STEM, but to attack a particular student team based on their race and encouraged others to disrupt the contest and manipulate the vote, and the attempt to manipulate the vote occurred shortly after those posts. Organizers said they have accurate records of the voting results prior to the attempted trolling, and they will notify the top three Public Choice teams in each category. A panel of judges will make the final determination of who will win the top prize: A trip to NASA headquarters. The winners will be announced later this month. Sharrieff, Skinner and Snell didn’t comment on the controversy to the Washington Post. However, the students did say they are pleased their project has received positive attention from people all over the country. The project has inspired a GoFundMe campaign that hopes to raise $20,000 for the teen scientists. As of Thursday afternoon, it had raised more than $3,100. When I was teaching mathematics in the 90s, before the internet, I had a book of “women mathematicians.” This was helpful for sharing inspirational stories with my middle school students, but there were just six women in this short book. These days, we have the internet – and more stories about women in mathematics. For example, the 2016 blockbuster movie “Hidden Figures,” based on the book by Margot Lee Shetterley, introduced the world to African-American women mathematicians Katherine Johnson, Mary Jackson, Dorothy Vaughan and Christine Darden. The world recently lost Maryam Mirzakhani, the first woman to win a Fields Medal (sort of like the Nobel Prize, but in mathematics). But we still need more stories about women in mathematics. While many mathematicians know of my colleague Marion Walter, she isn’t known well outside her field. And she should be, for her own story and the lessons she brings to our understanding of mathematics. Marion Walter will turn 90 years old this July, but when you ask her about growing up, she’ll tell you she hasn’t yet. She was born in 1928 to a Jewish family in Berlin. She and her sister, Ellen, attended a Jewish boarding school 390 miles away, in Herrlingen, Germany. In 1939, Marion and Ellen left Nazi Germany on a Kindertransport, the rescue operation that evacuated thousands of Jewish children to England before the outbreak of World War II. When the war began, her school – like many others on the south coast – was evacuated to the English countryside. Marion Walter is professor emerita of mathematics at the University of Oregon. At Christmastime in 1944, the headmistress of Marion’s secondary school called her to ask if she knew yet what her plans were now that she had graduated. It was the middle of the winter, in the middle of the war, and the math teacher had just quit unexpectedly. So the headmistress offered Marion the position, for the salary of 10 shillings per week. This was enough for Marion to purchase fish and chips in the neighboring village, if she biked there. Though Marion still had to sleep in the dormitory with her students, she was pleased to have access to the teachers’ lounge. At age 16, Marion taught math to students aged 5 to 16, and says that her graduating students all passed their school certificate examination. Marion taught for two terms before moving on to her next adventure: academic studies in mathematics and education. She arrived in London in the fall of 1945, where she began her formal study of mathematics at the Regent Street Polytechnic. After she attained her intermediate Bachelor of Science degree in mathematics, she moved with her family to New York City. While there, she earned a bachelor’s degree in mathematics and education from Hunter College, then a master’s degree in mathematics from New York University. She studied at night because she did computing work during the day. Marion worked on computations for research professors at New York University, using a Marchant calculator. This mechanical computing machine required the user to physically move a cylinder over when adding numbers with multiple digits. Marion went on to earn her doctorate in mathematics education from the Harvard Graduate School of Education, and was hired to teach at Simmons College. While in Massachusetts, she founded the Boston Area Mathematics Specialists, a group focused on improving the teaching and learning of mathematics for school children. In 1977, she moved to the University of Oregon. I met her there in 2016. Marion’s major mathematical line of study has been problem posing – the art of asking and refining mathematical questions. Her most significant book is likely “The Art of Problem Solving”, co-authored with mathematics educator Stephen Brown. She has also written several articles and children’s books about mathematics. Marion is also one of few people to have a theorem named after her, based on the following question: If the sides of a triangle are trisected, what is the resulting area of the hexagon that’s created? Like Marion, we can benefit from cultivating a sense of wonder. Wonder at how people make sense of mathematics, and wonder at how mathematics can describe the world. Wonder keeps us learning and growing. I asked Marion, who retired in 1993, if she had any advice to share. She was adamant on two counts. First, adults should never tell children, “I was not good at math.” And second, they should not tell children that they are wrong. Research supports both claims. Telling students we’re not good at mathematics sends the message that they might not be either. And when children think they are not good at math, it hurts their ability to engage with it. On the second count, when someone has a “wrong” answer in mathematics, it’s often because they are thinking about a different problem, or the same problem in a different way. That said, sometimes there are mathematically incorrect answers. So what do we say? Marion suggests asking, “How are you thinking about the problem?” When children are partners in problem-solving, they are invited into an apprenticeship as mathematicians. The next time you have a reason to think about mathematicians, I hope you will remember Marion Walter. Women and girls have been told, in many ways, that there is no room in math and science for them. Representations matter. The more powerful women we see in mathematics, the more evidence we have that mathematics is for all people. Children who are learning about the world, and their potential place in it, benefit from visions of who they might become – perhaps a woman in mathematics. On July 14, Maryam Mirzakhani, Stanford professor of mathematics and the only female winner of the prestigious Fields Medal in Mathematics, died at the age of 40. In just a few hours, her name, both in her native Farsi (#مریم میرزاخانی) and English (#maryammirzakhani), was trending on Twitter and Facebook. Most major news agencies were covering the news of her death as well as recounting her many achievements. The grief was especially hard-hitting for a generation of younger academics like me who have always held Maryam as a role model whose example is helping redefine women’s status in science and especially mathematics. The irony was that Maryam always tried to avoid the media’s spotlight. Her modesty and simplicity despite being the only woman to gain such high status in the world of mathematics – winning what’s often called the “Nobel Prize of math” – stood out to those who knew her. Unfortunately, I did not get the chance to meet Maryam personally. But like many of my Iranian peers in academia, I looked to her example as proof that the world would welcome us and our scientific contributions no matter our skin color, nationality or religion. As people around the globe grieve the loss of this talented mathematician, Maryam’s life stands as an inspiration for young girls and boys from all walks of life the world over. Maryam Mirzakhani in her own words in a video by the Simons Foundation and the International Mathematical Union. Despite her calm expression and warm smile, Maryam was a warrior. She and her family, alongside many other Iranians, lived through the hard economic and social transformations after the Iran revolution in 1979 and also survived the eight years of the Iran-Iraq war a few years after that. Maryam originally wanted to be a writer, a passion of hers that never faded away even during her postgraduate studies. However, she found an even greater joy in how rewarding it felt to solve mathematical problems. As a student, she was the first female member of Iran’s national team to participate in the International Math Olympiad, and she won two gold medals in two consecutive years – still a record. She received her bachelor’s degree from Sharif University of Technology in Iran and later a doctorate from Harvard. In 2014, Maryam was recognized with the Fields Medal, the highest-ranking award in mathematics, for her efforts in what’s known as hyperbolic geometry. Her work focused on curved surfaces – such as spheres or donut shapes – and how to understand their properties. Her achievements have applications in other fields of science including quantum field theory, engineering and material science, and could even influence theories around how our universe was born. Unfortunately, when she was honored with the Fields Medal, she was already tackling her last challenge, the breast cancer that eventually killed her. Maryam’s contributions to the field of mathematics will long be remembered. But just as important is her legacy as a role model. Maryam was an Iranian, a woman and an immigrant to the United States. Unfortunately, these three words together raise red flags for some in Western countries, particularly in the U.S., in the time of Trump’s proposed travel ban. Maryam’s legend may continue to grow after her early death. Still only 20 percent of full-time math faculty at U.S. universities are women, according to a 2015 demographic survey of 213 departments by the American Mathematical Society. Research shows that stereotyped role models can influence whether people “see themselves” in certain STEM careers. The example of a woman who rose to the top of this still very male field may help inspire math’s next generation. In the same way people think of Marie Curie or Jane Goodall as scientific pioneers, Maryam Mirzakhani will go down in history as a trailblazer as well as a mathematical genius. KELVIN BEACHUM, THE newly-signed tackle for the New York Jets, is on a mission. And it has nothing to do with bouncing back from a sluggish season after suffering a serious knee injury. Instead, Beachum wants to find a way to tap into the millions of football fans that the NFL has cultivated and use its visibility, access and reach to tout the importance of science, technology, engineering and math, or STEM. "How do we take the NFL and leverage all the access they have – its millions of different fans out there," he asked Friday at U.S. News STEM Solution conference in San Diego, California. "How do we engage the NFL on a deeper level than just, 'Hey, let's engage the fans?'" The Texas-native graduated from Southern Methodist University in 2010 with a bachelor's degree in economics and a minor in sports management. The Pittsburgh Steelers drafted him in 2012, where he played starting left tackle until an injury sidelined him in 2015. In 2016, he signed with the Jacksonville Jaguars during free agency, and most recently, he signed on to play for the New York Jets. When he's not training and playing, Beachum spends time in classrooms and schools, helping children, especially minority and disadvantaged youth, develop a passion for STEM disciplines and STEM careers, focusing mainly on robotics, mechanical engineering, computer programming, coding and aviation. "I say this all the time and it's a message I hold to be true," he said. "Everybody can't go pro in football, but everybody can go pro in STEM." The idea to use sports to engage students in STEM fields isn't new, but it's catapulted in recent years, especially as the gap has widened between those with access and exposure to STEM and those without. The goal is simple: Take something that young people can relate to and feel passionate about, like football, or sports in general, and use it to get them thinking about and excited about STEM. When it comes to football, Beachum said, there are environmental majors who take care of the field and finance majors who work on athletes' contracts. "There are a number of different opportunities for our young people to get involved," he said. To be sure, Beachum isn't alone in his effort, even within the NFL. A growing number of teams, including the San Francisco 49ers, have launched various STEM initiatives. One of the biggest challenges, explained Jesse Lovejoy, director of STEAM Education & the San Francisco 49ers Museum, is figuring out how to pique the interest of students and hook them while they're still young enough to amass a significant enough STEM foundation to be able to pursue it as a career. "When I was a kid," he said, "I had a fixed mindset of 'I'm not good at math.' That's a stigma I had boxed myself into." Lovejoy could calculate earned run averages, runs batted in and a whole host of other baseball statistics, "But nobody told me that was math," he said. "We have to light that fire, and the way to do it is by doing things like we're doing – taking something like sports and saying, 'This is your access point.'" Today, Lovejoy helps run a free STEM education program for students in grades K-8, which has so far reached 100,000 students. That's also what Ricardo Valerdi, founder and chief scientist at Science of Sport and engineering professor at the University of Arizona is doing – teaching children about biomechanics, physiology, speed, acceleration, launch angles and more. Valerdi partners with the Arizona Diamondbacks, San Diego Padres, Los Angeles Angels of Anaheim, Colorado Rockies, Washington Nationals, Houston Astros, Atlanta Braves and others to host children at the Major League Baseball stadiums to help them make the connection between sports and STEM. "They think they're going to a baseball camp," said Valerdi. "They're really going to a STEM camp." The first African-American woman to lead an S&P 500 company says businesses must constantly innovate to stay globally competitive. Xerox Chairman of the Board Ursula Burns has worked for nearly 40 years to ensure the printing and copying company adapts in an increasingly paperless world. A regular on both Forbes' and Fortune's most powerful women lists, Burns has come a long way from her childhood in the New York City housing projects. 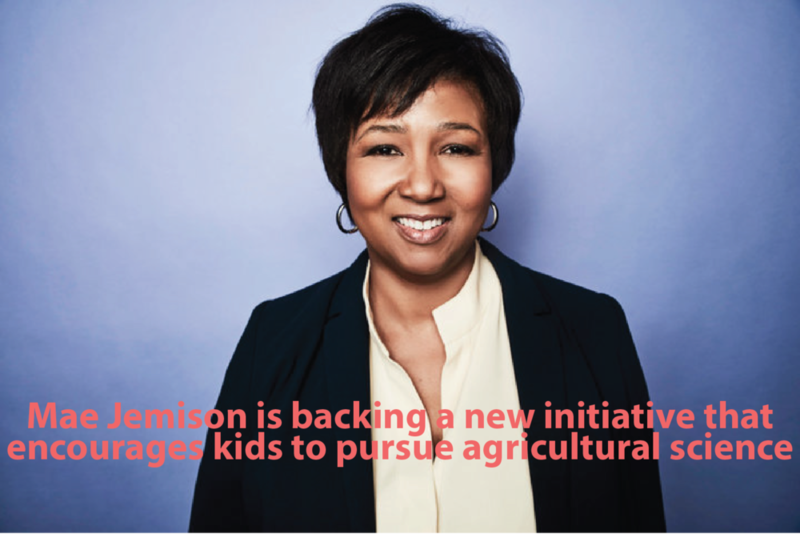 Burns graduated with a bachelor's degree in mechanical engineering from Polytechnic Institute of New York University in 1980, and earned her master's the next year from Columbia University. Starting as an intern at Xerox in 1980, Burns worked her way up to the top position, becoming the first African-American woman to lead an S&P 500 company. Burns became Xerox's president in 2007, CEO in 2009 and chairman in 2010. Soon after being named CEO, she led Xerox's $6.4 billion acquisition of Affiliated Computer Services, the largest purchase in company history. In 2016, she spearheaded the company's split into two publicly traded companies: Xerox Corp., focused on document technology, and Conduent Inc., for business process outsourcing. She stepped down as CEO after the split, remaining chairman of the new Xerox. Burns helped lead the White House's national STEM program from 2009 to 2016, and was chair of the President's Export Council from 2015 to 2016. She also sits on the board of directors of American Express, Exxon Mobil and the Ford Foundation. You are regularly regarded as one of the most powerful businesswomen in the U.S. Did you always know that you wanted to lead a major company? It came with time as I progressed in my career. You've got to think about the time that I grew up. I graduated from college in 1980; I graduated from high school in 1976. So I was growing up in the late 1960s, early 1970s. Access to the information for me to even know what a major company was, how one was structured, that kind of thing, was just not pervasive. So no, I didn't have any knowledge of or aspiration to be running a major company. I did, though, have very clear direction from my mother that I would be successful. That was an expectation that was laid pretty clearly, but her idea of success was not necessarily to run a company. JACKSONVILLE, Fla. - A Jacksonville seventh-grader raised over $15,000 to take a hundred girls to see the new movie "Hidden Figures" on Saturday. The movie details the untold story of three black women who helped provide the brainpower behind one of NASA's greatest achievements – landing men on the moon. The organizer, 13-year-old Taylor Richardson, said she saw the movie at a screening in Washington, D.C., and was inspired to bring girls back home to see the film. Taylor raised the money needed to purchase 100 tickets and invited girls from all backgrounds to join the viewing. She said she hopes they will understand that they, too, can be pioneers. “We invited a hundred girls to come see Hidden Figures and be inspired by what these women did and hopefully will follow their dreams knowing these women could do what they did,” Taylor said. Like most who joined the viewing, Angela Zabrin hadn’t heard of the women in the film. Adults like Dania Frink also saw the movie for the first time, supporting Taylor's push to inspire others, and hoping Saturday's movie screening sparks more positivity in the community. “Makes me proud to be living here to see young people like Taylor -- young leaders,” Frink said. Taylor said she's planning to get some rest before her next venture, but she said she wants to continue inspiring young girls to believe they can do whatever men can do. IBM and the New York Times’ T Brand Studio have introduced a new augmented reality (AR) application profiling early unsung heroes of innovation in STEM fields. Reveal their inspiring stories when you scan an AR marker like the one below. 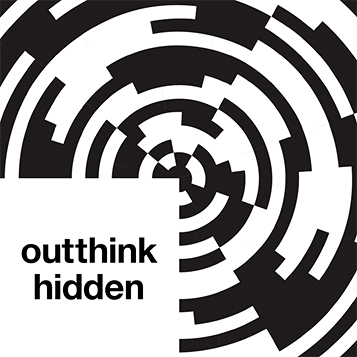 Activate text, photos and video content about these hidden figures within ad units on nytimes.com, via ads in select print editions of The New York Times, and at 150 geofenced locations throughout the U.S. Placing these hidden figures out in the world as virtual monuments for you to explore is our way of imagining a world where every STEM innovator can be encouraged, recognized and celebrated. Download the new T Brand Studio AR app to see hidden heroes of STEM. Use the app to scan the marker at below and meet your first hidden figure. At the Consumer Electronics Show (CES) 2017, Soledad O’Brien hosted a panel on the importance of diversity in STEM fields, presented by IBM and featuring special guests from the Twentieth Century Fox film, ‘Hidden Figures,’ and leaders from the industry. Soledad was joined by Academy Award winner Octavia Spencer, the film’s director Theodore Melfi, Elizabeth Gabler (President Fox 2000 Pictures), Leah Gilliam (Girls Who Code), Rashid Ferrod Davis (P-TECH), Lindsay-Rae McIntyre (IBM Chief Diversity Officer) and Kristen Summers (Watson Public Sector). In Michelle Obama's final speech, she honored the 2017 School Counselors of the Year and gave one last final message of hope, thanking her supporters and saying, "being your first lady has been the greatest honor of my life and I hope I've made you proud."